How can small farms make the most efficient use of their feed resources and reduce potential environmental impacts? They do it by managing their feed supplies and animals carefully using some of the tips mentioned below. Farmers also need to pay special attention to nitrogen and phosphorus. Additives, supplements, hormones, antibiotics, and etc. are generally very effective ways to improve animal performance and efficiency. If used, these should be fed as prescribed on the label, or under the care of a veterinarian. Hormones such as anabolic implants and steroids or rBST (recombinant bovine somatotropin) improve production efficiency, growth rate or milk production in cattle. Hormones are not used in pig or poultry production. Antibiotics, which, when used properly in the diet, can result in improved feed efficiencies and health. Using antibiotics for the purpose of growth promotion and not disease control (called sub-therapeutic use) is under a great deal of scrutiny and is becoming more controversial as scientists look for ways to combat antibiotic-resistance in microbes and pathogens. Products that improve nutrient efficiency will also reduce excretion relative to production. By-product (often also called co-product) feeds are often used in animal diets. These are by-products of other industries, such as the production of distilled spirits, ethanol, or beer, wheat processing, milling, and soy oil among others. These co-products, such as brewer’s grains, distiller’s grains, soy hulls, and others can make excellent animal feedstuffs. There are also byproducts from the wheat milling industry, such as wheat bran, middlings, reddog, shorts, etc. By-products from wet corn milling give us high fructose corn syrup and a variety of other corn products including corn gluten feeds and meals. In addition, there are products such as citrus pulp, beet pulp, and whole cottonseed. Some farms even feed expired foods that have been returned to distributors from grocery stores. One disadvantage of by-products is that their nutrient content is often variable; these feeds should be sampled regularly so estimates of nutrient content can be used in formulating diets. Sometimes, the by-product supplier will provide a nutrient analysis when requested. Advantages of by-products are that they can often be purchased more cheaply than traditional feeds and utilize a material that might otherwise become a part of the waste stream. Every load of feed that comes out of the field during harvest or is delivered by the feed company is different from the previous load. Every bale of hay in the summer is different from the previous bale. Every scoop full of grain that is given to a horse or livestock animal is different from the previous container of grain. It is essential that producers get a handle on the variability of their feed and ensure that to the best of their knowledge and ability they are able to balance diets for the nutrients that are in the feeds they are using. There are feed and forage labs available and feed samples can be sent to these labs to determine nutrient content. In this way diets can be formulated based on the nutrient content of each individual component. It is possible to use published values when nothing else is available. However, these are only averages of many samples and may not reflect actual conditions. Every effort should be made to use feeds of a high quality. For ruminants to reach optimum levels of production, it is essential that forages be of the best quality possible. Those too high in fiber, or rained on during production, or that spoil in the silo, will result in lower levels of production, will be more costly to the producer, and may result in greater levels of nutrient loss. Sick animals are not productive animals, but will continue to consume feed since they have a requirement for body maintenance. They will continue to excrete nutrients in their manure. All animals should be on a regular health and herd management program. They should be vaccinated for disease regularly and monitored for special diseases. To reduce waste, temporarily reduce feed delivery to sick animals and gradually bring it back up to full levels as they recover. All domestic livestock animals can be affected by parasites. Parasites will infest the intestines and can result in substantial decreases in performance. Whenever this happens, the efficiency of nutrient utilization is going to decline and influence nutrient excretion. All animals should be on a regular de-worming and parasite control schedule. Toxins in the feed or water may also influence animal production. 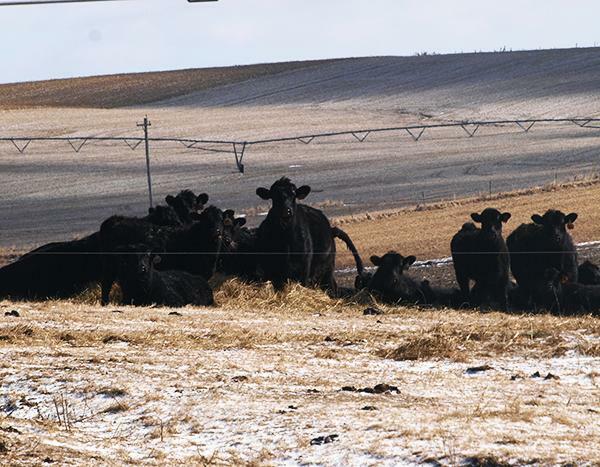 For example, during a drought year forage quality will often decline, and toxins, such as excess nitrates, may be taken up from the soil by plants and influence animal production. Plant growth stress can also result in the formation of mycotoxins in the feed; this can occur in both feed grains and forages. These toxins can result in decreased production, as well as sickness and death. Whenever toxins are believed to be a problem, it is important to test feed and water supplies to ensure the adequate consumption of uncontaminated feeds and water. Processing feed is helpful if animals are to digest and absorb nutrients. In recent years, the use of corn silage kernel processors has increased on dairy farms. Kernel processors typically use physical force to break down each kernel of grain and make the nutrients in the kernel more available to digestive processes. This has been shown to result in a significant increase in production in animals fed these diets. Feed processing includes grinding, flaking, steam rolling, and other processes that improve the availability of nutrients. For example, sorghum grain or milo is unavailable to ruminant animals and horses without some level of processing, such as grinding or steam flaking. It can be utilized by chickens that have the advantage of the crop and gizzard in their digestive system. If there is any down side to feed processing, it would be over-processing or over-mixing. Over-processing usually means that the feed reached too high a temperature. This causes chemical changes that can offset the benefits and actually tie-up or bind nutrients. Mixing feeds, particularly forage, for too long of a period of time can break particles down into smaller pieces. These pieces tend to move more quickly through the gastrointestinal tract and not be digested at a level required for optimum utilization and health of the animal. 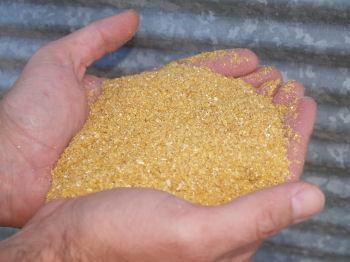 Processed feeds are also more expensive than unprocessed, and might not always be necessary (e.g. oats for horses). A hay bale fed on the ground like this one will result in as much as 40-50% waste. Hay feeders can greatly reduce the loss. It is common for animals to spill or waste feed. For example, pigs will waste as much as 20% of their diet while eating. This wasted feed is often wet, covered with saliva, and it will spoil and rot. If this feed is left in place, animals will not consume it. Silage left in the feed bunk and not consumed quickly is especially susceptible to spoilage and will not be eaten. Wasted, spilled, and rotten feed is a breeding ground for flies and attracts vermin like mice and rats. Bunks and feeders should be designed to reduce wasted feed. Bunks and feeders should be cleaned on a regular basis so spoiled or rotten feed can be removed. Do not feed animals on the ground. It is a common practice, but there is no greater source of waste than feeding an animal on the ground. Although this might be acceptable with beef cows or sheep on the open range, or even horses, it is not acceptable to feed animals on the ground near a stream. This sort of waste also contributes to the creation of mud in pastures and paddocks. Michael L. Westendorf and Carey A. Williams, Extension Specialists in Animal Sciences, Rutgers, The State University of New Jersey. This article was originally published as Rutgers Cooperative Extension Fact Sheet FS 1064. Updated November 25, 2008.